Target NEET at your convenience! Get the complete classroom experience with Edu Tab. Prepare at your convenience and avoid the hassle of travelling time, providing more focus on studies. Get mentored by your personal NEET mentor to gain an in-depth understanding of the syllabus. Learn new studying tips and techniques while keeping track of your studies. Get yourself acquainted with the examination scenario. Practice with our mock test designed according to the latest exam pattern and test format. Prepare what you want, where you want at your own pace. With video lectures, understanding those difficult concepts gets easier. Would you leave your preparation to chance? Get the right evaluation with Student Performance Report and get a detailed, segregated report to assess your strengths and weaknesses. Fare better against your competitors and assess where you stand with the All-India Test Series. Remember, there is always more room for preparation! Keep your revision in check by quickly going through flash cards for formulas and concepts. How can you benefit from Edu Tab? 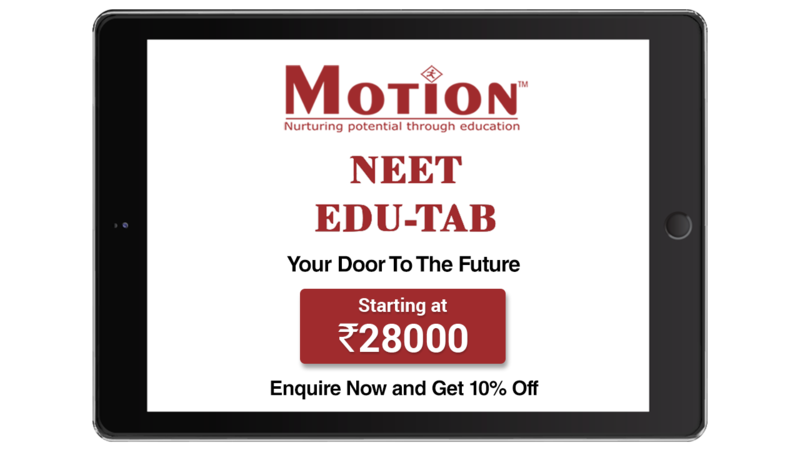 With Edu Tab you get the right guidance and expertise to crack NEET at your convenience. Prepare what you want and when you want, and lose the time constraint. How can you access Edu Tab? You can access the Edu Tab at your convenience, from home or any where else. All you need is an internet connection. What differentiates Edu Tab from the rest? Edu Tab provides you the resources to stand apart from the herd and assess your preparation to fare better among your competitors. Motion… The one thing that clicks in my mind when I hear this name is the most caring institute of Kota. The staff and teachers at Motion are also very supportive. Improving yourself daily is important. This is the one thing that I have learned from Motion as the mentors here give equal attention to all the students. I am thankful to the institute because of which I got into IIT Kharagpur. This was only possible due to their teaching methods, which focus on clearing concept and fundamentals. Through Motion, I was able to achieve my dream, as teachers at Motion are available for students 24x7. Classroom lectures being recorded is the unique feature of Motion. I was in the first batch of Motion (2007). Hard work never killed anyone, but with hard work, you can kill anything... And, I followed the same. And, at present, I am working in FedEx Freight at Memphis, Tennessee. Thank you, Motion, for building confidence in me. I am proud to be a part of the Motion family. Your Dream Of Being A Doctor Is This Close! With Ask-The-Expert feature, get your doubts solved and strengthen your basics, leaving no room for error. Expert Assistance at your convenience on Edu Tab. Get mentored by an Expert NEET Mentor and learn new strategies to crack the exam in the allotted time. Make the most out of your experience with the mentorship feature on your Edu Tab. Evaluate your preparation and understand your scope of improvement with assessment tests. Take the test at anytime, anywhere on your Edu Tab.